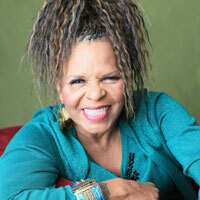 Ntozake Shange was born Paulette Williams into an upper middle-class African-American family. Her father was an Air Force surgeon and her mother a psychiatric social worker. Cultural icons like Dizzy Gillespie, Miles Davis and W.E.B. DuBois were regular guests in the Williams home. Shange attended Barnard College and UCLA, earning both a bachelors and master degree in American Studies. Shange’s college years were difficult, however, frustrated and hurt after separating from her first husband, she attempted suicide several times before focusing her rage against the limitations society imposes on black women. While earning a master’s degree, she reaffirmed her personal strength based on a self-determined identity and took her African name, which means “she who comes with her own things” and she “who walks like a lion.” Since then she has sustained a triple career as an educator, a performer/director, and a writer whose work draws heavily on her experiences of being a black female in America. She is one of America’s greatest living writers—an acknowledged master in the genres of drama, fiction, memoir, and poetry. In a hugely prolific career, Shange has written 15 plays, 19 poetry collections, 6 novels, 5 children’s books, 3 collections of essays, and a memoir called Lost in Language & Sound. Learn More.